We had a very pleasant encounter while having breakfast this morning. 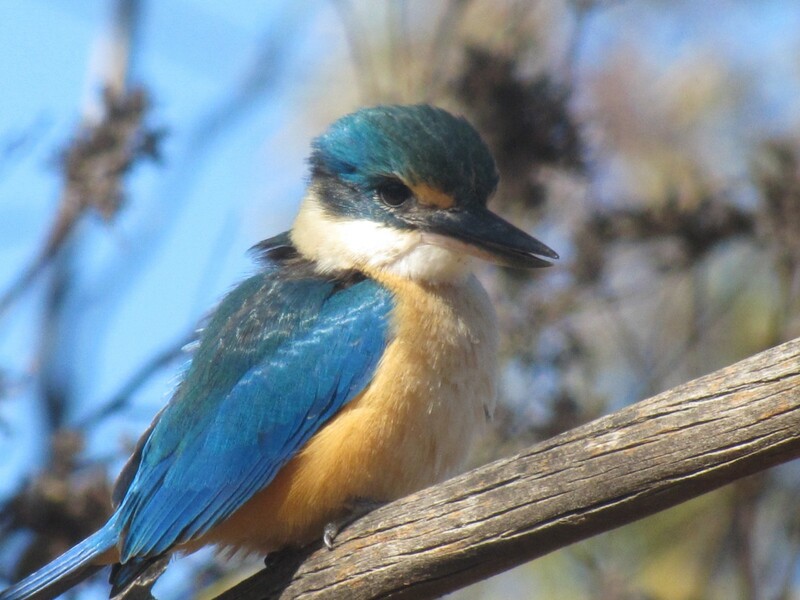 I was focussed on completing the daily crossword in the newspaper when my wife excitedly drew my attention to the Sacred Kingfisher just outside the window of the sun room where we often eat our meals. My bird records are not completely up to date, but we are certain it has been several years since we had seen one in our garden, making the sighting just that little bit extra special. I had preciously taken a few photos of this species but rarely at such close quarters. This was about 5 metres away and he couldn’t see us through the glass due to the early morning reflections. I raced to the office to get my camera – yes – even at my age I can still raise a trot, albeit a modest one. 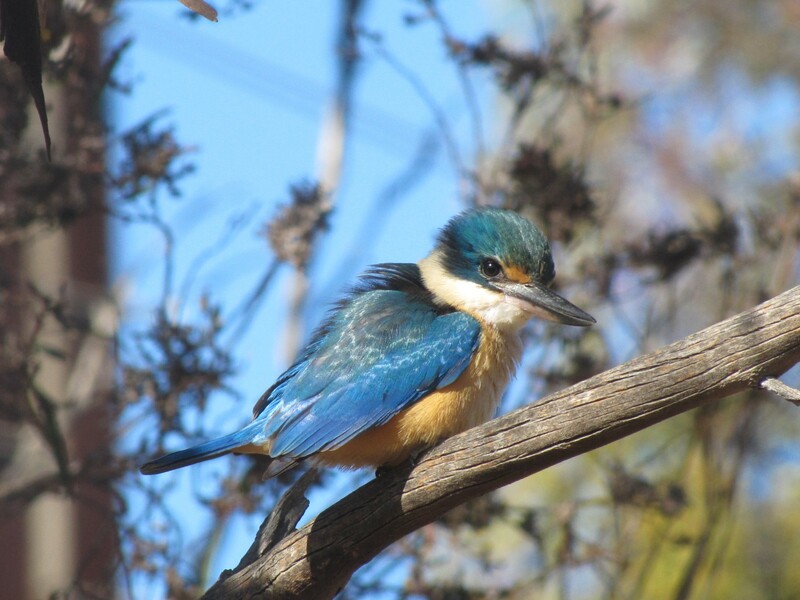 For the next 15 minutes the kingfisher posed in a number of ways for my camera. The results speak for themselves. In between taking photos we were able to observe some of its unique behaviours. As it sat almost motionless on a dead branch – typical perching behaviour – it would gently bob its tail. It would then turn its head slightly, usually peering intently at the ground. During the 15 minutes it stayed the bird dived like an arrow to the ground to catch its prey. We couldn’t see clearly what it was eating but this species eats beetles, grubs, cockroaches, small lizards like geckos and an assortment of small insects. This species usually gives away its presence in the bush by its far-reaching ki-ki-ki-ki call. On this occasion it was silent throughout the 15 minutes. 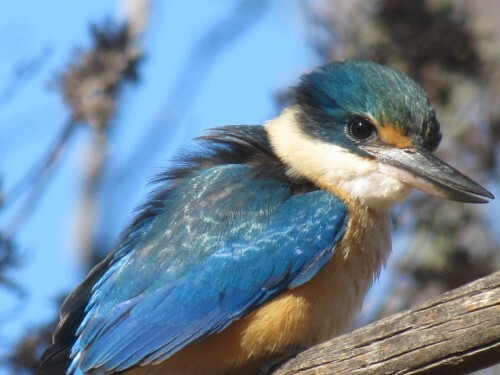 The Sacred Kingfisher is found over much of Australia. They are migratory, moving south to breed in the summer months. 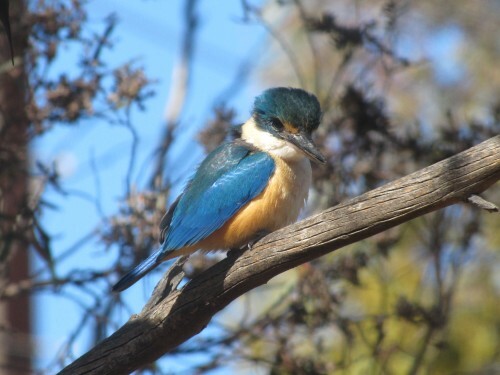 Other kingfisher species in the region where I live in South Australia include the very similar Red-backed Kingfisher and the well-known Laughing Kookaburra. This is just a sample of the best photos I took – out of 36 all together. I was so inspired by this event that I went and wrote a poem about the encounter. You can read the poem here.